Note that the title page is available for viewing, but is not a part of the sale item. The Terrace From Poetical Sketches of Scarborough. Size: 200 x 130 mm (8 x 5 inches). Condition: Original colour, slight discolouration of paper, some spots of foxing, otherwise very good. The Sands From Poetical Sketches of Scarborough. Size: 200 x 130 mm (8 x 5 inches). Condition: Original colour, slight discolouration of paper, otherwise very good. The Church From Poetical Sketches of Scarborough. Cornelian Bay From Poetical Sketches of Scarborough. Widow Ducker and her Nymphs From Poetical Sketches of Scarborough. Condition: Original colour, slight discolouration of paper, afew spots of foxing, otherwise very good. Mr Burchell's First Visit From The Vicar of Wakefield. Hunting The Slipper From The Vicar of Wakefield. The Vicar's Family on the Road to Church From The Vicar of Wakefield. The Gross of Green Spectacles From The Vicar of Wakefield. The Vicar Selling His Horse From The Vicar of Wakefield. The Vicar in Company with Strolling Players From The Vicar of Wakefield. The Surprise From The Vicar of Wakefield. Attendance of a Nobelman From The Vicar of Wakefield. Scold with News of Olivia From The Vicar of Wakefield. Domestic Arrangement in Prison From The Vicar of Wakefield. Sophia Resued from the Water From The Vicar of Wakefield. The Departure from Wakefield From The Vicar of Wakefield. The Welcome From The Vicar of Wakefield. The Social Evening From The Vicar of Wakefield. 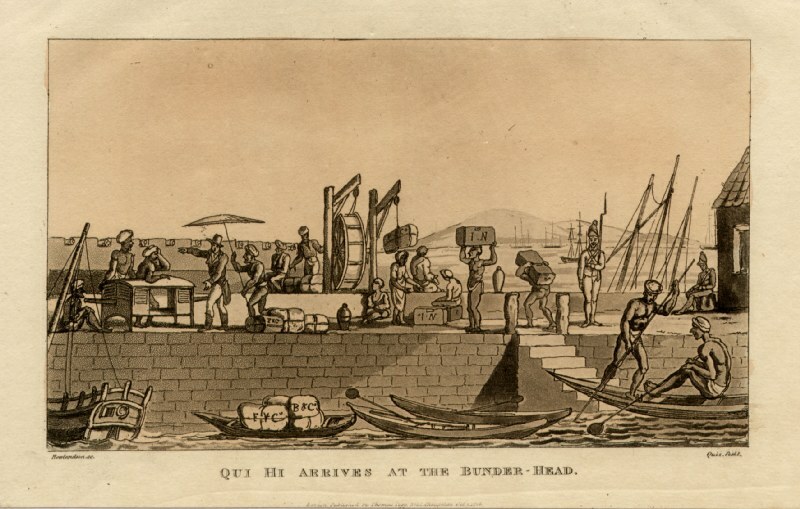 Images of India Qui Hi Arrives at the Bunder-Head Thomas Rowlandson, 1816 . From ‘The Grand Master or Adventures of Qui Hi? in Hindostan. A Hudibrastic’ ‘Poem in eight cantos by Quiz’. Published by Thomas Tegg, London, 1815/16. Aquatint, Size: 210 x 130 mm (8 x 5 inches). 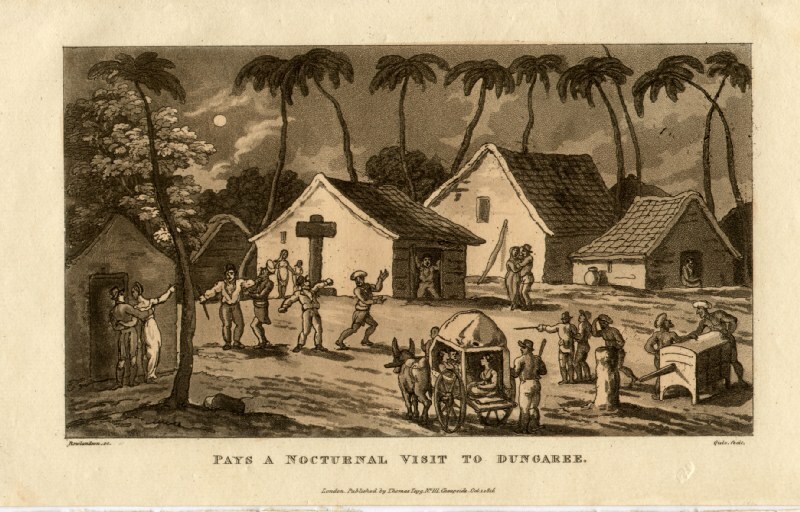 Images of India Pays a Notcurnal Visit to Dungaree Thomas Rowlandson, 1816 .